The spring allergies hit like a freight train over the weekend, leaving me a drippy, sodden mess. Their arrival is inevitable, but always quixotically unpredictable. This year, my allergies came earlier than ever. I never know why they are timed as they are, or whether the unpredictability is just part of their devilish game to inflict maximum disruption and physical malaise. Oh, allergies! My allergies! Oh crap! You’ve come again! Now I’m sniffling and sneezing, with sinuses adrain! And my ears and nasal passages feeling heavily clogged. ’cause thanks to you I now must buy 10 boxes of Kleenex! Oh, allergies! My allergies! You literally are a pill. 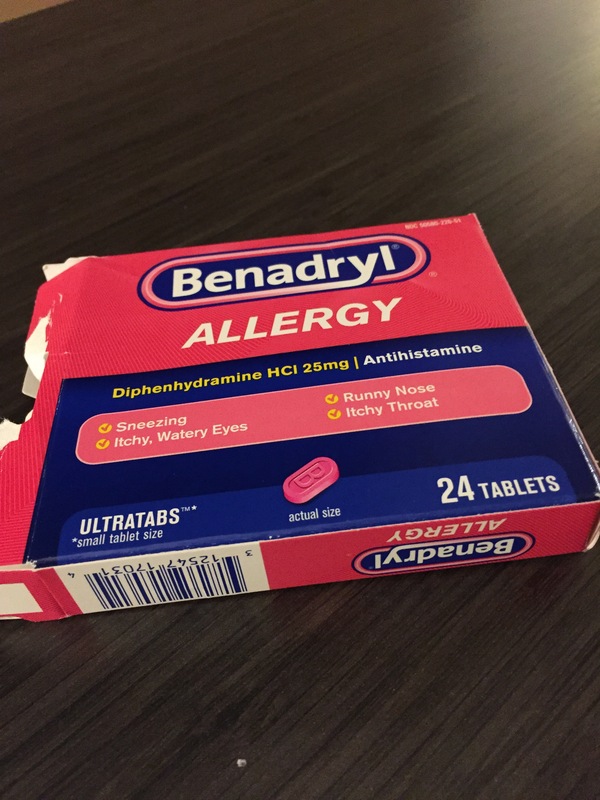 Each year when you arrive I gobble lots of Benadryl. but I’d rather deal with congestion than a bad case of the flu. Kasey is a unique dog. Many dogs like trash, of course. Kasey does, too. 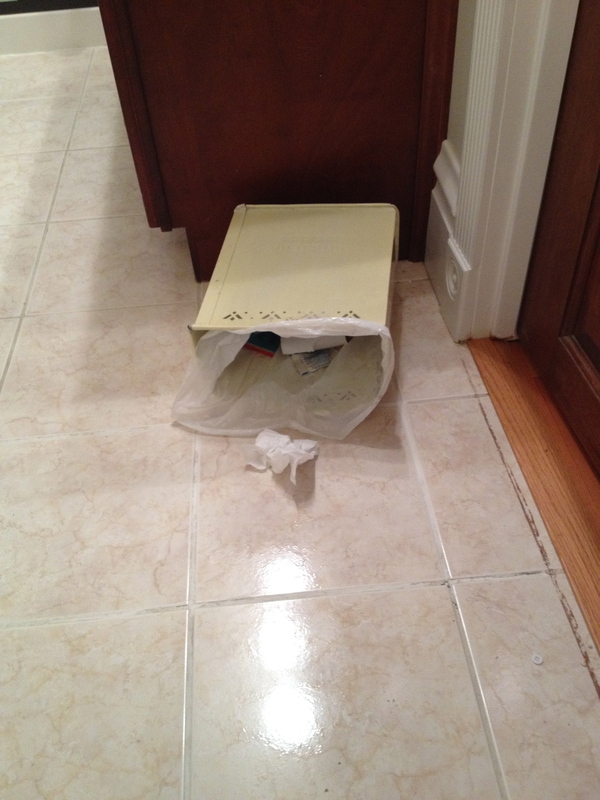 But Kasey especially craves a certain kind of trash — used Kleenex from the bathroom wastebasket. If you leave the bathroom door open and the wastebasket on the floor within Kasey’s reach, it’s just a matter of time before you hear a bang and clatter and then see old Kasey shuffling by, munching on a mouthful of tissue and guarding it zealously when you try to get it away from her. Disgusting, you say? Sure! But dogs do a lot of disgusting things, from appalling tongue swabs of their nether regions to up-close-and-personal sniffs of assorted animal droppings to hearty bites of flyblown roadkill. By comparison, chowing down on used Kleenex is a minor transgression in the canine health and sanitation area. The mysterious question, however, is: why used Kleenex? As I’ve mentioned before, there’s a lot that we don’t know about Kasey’s history, given her Erie County Humane Society past. Did she once have to survive on Kleenex to fill her belly? Is eating used Kleenex the canine equivalent of nose-picking? Does the Kleenex remind her of something pleasant from her past? Are her senses of smell and taste so acute that she can identify the human who used the tissue? Kasey will never tell. I’d ask her, but she’s working on a mouthful of Kleenex right now. Today I’m feeling bruised and battered, like I’ve gone 12 rounds with Joe Frazier and he’s been working on the body the whole time. My allergies are to blame. I never know what mold, fungus, dust, or mite has acted as the trigger, but the symptoms are unmistakable. My respiratory system kicks into overdrive and suddenly begins producing mucus as it has never produced it before. A disgusting flood of phlegm cascades sluggishly down the back of my throat like the River Styx. I cough repeatedly in response to the irritation. And, worst of all, my body is wracked by explosive, insuppressible sneezes that follow immediately, one after the other, like bullets from a machine gun clip. These sneezes aren’t the gentle ejections of air you typically see in Kleenex commercials, either. No, they are violent, full-bodied actions that involve every fiber of my being. They radiate down to the core of the torso, cause the abdominal muscles to spasm and clench, rattle past the rib cage, and jostle the organs. Cruel personal trainers would love to be able to replicate similar muscular activity. I might experience as many as 10 of these eruptions in a row, and there is nothing to be done about it. All you can aim for is riding it out and hoping that the next morning, when you awaken feeling sore and beat up, you’re done with the terrible sneezing.